Thanks for stopping by my 50th Birthday Celebration, Day Seventeen. 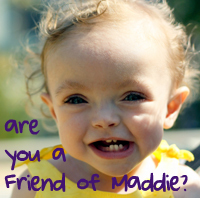 Friends of Maddie is an organization founded by one of the nicest couples on the planet, Mike and Heather Spohr. Following the death of their toddler daughter Maddie, they first raised about a zillion dollars for March of Dimes and then founded Friends of Maddie to help other families with babies in neo-natal intensive care. Providing NICU Family Support Packs to the nursing staff of Level III NICU’s across the country which will be distributed, at their discretion, to families of children being admitted to the NICU for long term care. Assisting in finding temporary lodging for families who live beyond commuting distance of the NICU that is treating their child. Here’s the donation page. You can also show your support with a Friends of Maddie button and show Maddie’s sweet face on your site.